World leading precision engineering company, Renishaw plc, turned to MecWash to provide a comprehensive aqueous component cleaning system for its new production facility in Miskin, South Wales, following the success of similar installations at its other sites in New Mills and Stonehouse. The award-winning company, which recently won its 16th Queens Award for Enterprise, specified a MecWash Midi as part of the state of the art manufacturing facility that officially opened in October 2012. Renishaw is a recognised global leader in metrology, motion control, Raman spectroscopy and precision machining. Its products are used in a diverse range of applications including machine tool automation, co-ordinate measurement, machine calibration, CAD/CAM dentistry, shape memory alloys, large scale surveying, stereotactic neurosurgery and medical diagnostics. Precision engineering demands precision cleaning – even the tiniest particles of contamination can interrupt the operation of the machine, leading to reduced performance, increased maintenance and added costs as a result of down-time. Metal components used in a number of Renishaw’s systems are currently manufactured at the Miskin site, which also produces Additive Manufacturing machines otherwise known as 3D printers. Global demand for the very latest 3D printing technologies is growing - Renishaw’s Miskin facility will ensure the ambitious company is able to meet its customers’ requirements. The complex parts manufactured at the Miskin site are made of various metals and it is vital that any contamination from the production process is completely removed before the components are used in Renishaw systems. The company has an established reputation for delivering the highest quality products built using immaculately clean components, a finish which can only be achieved by using a proven, quality cleaning method. Renishaw has worked with MecWash for more than eight years; the innovative company already uses four MecWash aqueous component cleaning machines, which all include wash water recycling ‘Aqua-Save’ Systems to reduce the amount of water used, supporting the company’s environmental commitments. Specifically designed to process complex and intricate machined or pressed parts that require very high standards of cleanliness, surface finish and dryness, the Midi from MecWash offers a number of features which can be tailored to meet the customer’s exact requirements. The 400 model commissioned by Renishaw utilises ultrasonics and high flow washing – guaranteeing that all components meet exacting standards. Baskets divided into various sections in the 400x450x650 chamber allow operators to clean and dry components destined for a number of different applications at the same time, ensuring optimum efficiency, and the Midi’s robust construction ensures it is operational 24/7 – another vital factor for Renishaw which operates three shifts at its Miskin site to meet global demand for its products. Miskin is a shining example of a modern advanced manufacturing facility; airy and bright, it features full air-conditioning, noise reducing measures and an extraction system that removes airborne contaminants, in line with its other production sites. 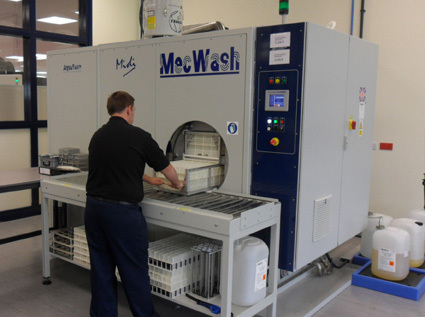 Renishaw’s commitment to ‘enhancing efficiency through innovation’ is tangible throughout its operation – the selection of a MecWash Midi will ensure the efficient cleaning of all components produced at Miskin. Find out more about Renishaw’s Miskin site here or contact MecWash's sales team for details of the MecWash Midi and other products, including Aqua-Save wash water recycling systems.